Calling all pet owners! 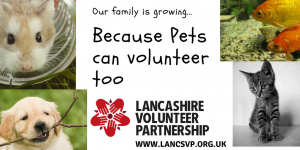 We are excited to announce from 2019 Lancashire Volunteer Partnership will be accepting applications from pets as we form Lancashire Volunteer Pets. There will be a wide a range of volunteering opportunities including Police cats, befriending fish (any type smaller than 10cm in length) budgies and canaries to assist with singing groups. We also plan to place hungry rabbits and guinea pigs to maintain lawns across Lancashire in the summer months. Make a note of the date today, applications will be dealt with in the order they were made. Obtain 2 references for your pet. Ensure you have evidence of your pet’s address for the previous 5 years. Ask your pet to sign the back of a passport photo. Further information will be provided when the application process is confirmed after midday 1st April. Update: Unfortunately due to issues with the ‘vetting’ procedure we are unable to offer volunteering opportunities for pets at this time! As many of you spotted on Social Media it was indeed an April Fool’s story.